Mufasa was sitting alone, far from Pride Rock, when his brother appeared. "Yes. I wanted to talk with you" the king answered. Scar was slightly nervious, could it be possible that Simba told his father about 'their little secret'? "Today Simba went to the Elephant Graveyard with Nala. He tried to prove how brave he was" Mufasa arose and began walking, followed by Scar. "Oh, that kid surely is fearless" Scar remarked. "The hyenas attacked them, and if I wasn't near that frontier in that moment, they..." Mufasa remained silence. As he talked, Scar got more and more frustrated, because his plan failed when he was sure it was a success, who would ever suspect of him when the cubs were on the hyenas' land? But Mufasa was there, and he ruined everything. 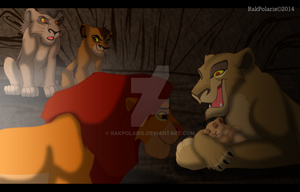 Scar realized in that very moment, that if he wanted to kill Simba, he should first do something with his brother. Now, after the hyenas' attack, Mufasa and Sarabi doubtless would be more alert with their son; no more 'explorations', so no more easy plans to throw off that annoying furball. "Did you tell Sarabi...?" Scar asked, this time actually interested. "No. I couldn't. 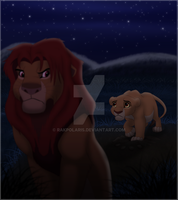 I don't want to worry her... And in fact I already talked with Simba, so he won't disobey me again"
"He's just a child. Children do stupid things. Don't bother yourself" Scar replied, trying to look "woebegone" because of his brother's feelings. Then, Mufasa stopped and turned his head back to his brother, who stopped too in that very moment. "Today I almost lost him, Scar"
"Yes, but eventually you didn't" the king's brother attempted to pretend he understood Mufasa and that he was trying to encourage him. "You are a good brother, it's great I can speak with you. I am sure that if you were the older one, you'd make a great king too" Mufasa said, feeling so glad he could talk with his brother about Simba. Even if Scar was weird and the other lionesses didn't like him too much, he was still his little brother, and nothing else could matter. Without saying a word, Mufasa began to walk heading back to Pride Rock until he was so far he was just a reddish dot, but Scar didn't follow this time. He wanted to speak with the hyenas fisrt. "Oh, brother, sure I will" he laughed. Why didn't Mufasa told Sarabi anything about tha Elephant Graveyard? Well, I think she didn't know it because if she did, she would be more protective with his son, and if we think the stampede was the next day, the natural thing would be of Simba being with his mother instead of his uncle (let's suppose Mufasa had to patrol the frontiers that day so he couldn't take care of Simba) and in that scene, when Scar told Simba about his adventure and Simba asks him how he knew it, Scar replies "Simba, everyone knows it" but it must be false, since I don't think Sarabi would let his son alone with the weird Scar, even if he's his uncle. No it did, because Pumbaa called Simba 'kid' when he was walking away in the desert. Scar lied about how he said " everyone knows about that." He was playing on Simba's naivety, and Scar is clearly viewed as odd amongst his relatives. But he is the kings brother, a close relation so he is trusted with Simba. That's what makes Scar the top Disney villain he killed his own kin, his brother, and tried to kill his innocent nephew just so he could rule. I think Mufasa possibly kept Simba's disobedience a secret. Because he remembered how he was a mischievous cub and he already scolded his son. So it wasn't really necessary for Sarabi to punish him. Sarabi has a softer side than Mufasa too. That's my view on it. Great drawing! It does look like it could be an actual scene from the movie. Yep, I think the same. Mufasa didn't tell Sarabi and he asked Zazu to remain silent about it. Nala didn't say a word to her mother either (well, actually Sarafina couldn't blame her daughter, could she? Nala didn't know what that place was because only Simba knew about it). Good point, that also makes sense. Yeah, I don't think Sarafina knew either. Sorry to annoy you, but you had three grammar errors, I noticed. Well, near the end, you accidentally wrote "borther" instead of "brother". "Did you told" is wrong. It's "Did you tell?" With common past-tense verbs, an "ed" is needed. So, it's "I already talked with Simba"
"Child do stupid things" is wrong. It's "Children do stupid things"
Sí, en este ordenador también se ve algo oscuro, aunque en el mío se veía bien... Trataré de reducir el filtro de azul oscuro para que se vea mejor y lo volveré a subir.